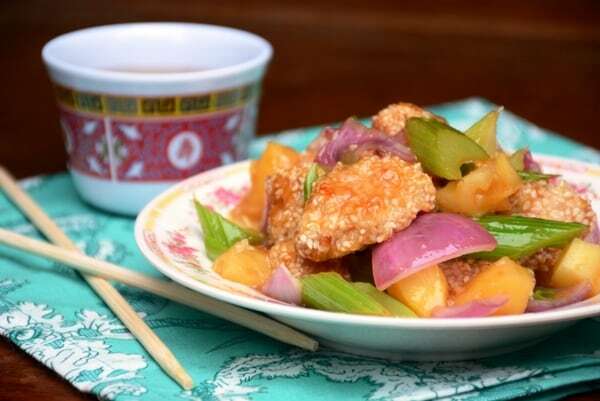 Oh how happy I am to bring you this beautiful and divine Paleo Sweet & Sour Chicken (or Shrimp or Fish) recipe from my friend Andrea Wyckoff’s Pure and Simple Paleo: A Low Starch Cookbook. You might know Andrea from her website Forest and Fauna and her previous site, Betty Rawker. If you don’t know Andrea, you should! She’s a delighful person and shares outstanding recipes using pure and simple ingredients. Andrea also gets quite creative with unique ingredients at times and I love that! While I always encourage simplicity as well as basic ingredients with my gfe approach, knowing how to get creative with unique ingredients can be extremely helpful when one has additional food intolerances. However, not everyone has time or perhaps aptitude to test out such ingredients and create successful recipes using them. Having someone like Andrea do that special work for us is invaluable! In some cases, Andrea uses new methods to actually create recipe ingredients. Her recipe Make Your Own Chocolate Chips is genius! It allows one to use whatever ingredients work for one’s intolerances and shares a very easy and surprising way to make the chocolate chips. I’ve used her method and it works like a charm! On both her blog and in her cookbook, you’ll find excellent—and super appealing—recipes that actually work. In her cookbook, I’m talking recipes like Donuts, Almond Flour Pancakes and Waffles, Bacon Brittle, Super Seed “Honey Wheat” Baguette, Tahini Buns and Bread, Macadamia “Mac” Mayo, Hummingbird Cake, Black Forest Cake, Key Lime Pie, Rich Vanilla Ice Cream, and so much more. There are 130 recipes in her cookbook! They’re all grain-free, gluten-free, dairy-free, nightshade-free, corn-free, soy-free, paleo, and low starch. Happily note the past tense. The power of dietary changes can be nothing short of phenomenal. 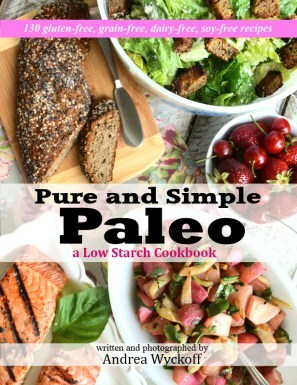 However, even if you’re simply looking for outstanding gluten-free or paleo recipes, her Pure and Simple Paleo: A Low-Starch Cookbook is a terrific choice! Now that you know a little bit more about Andrea’s personal story, her site, and her mission, and you’ve drooled over the previous photos of her Paleo Sweet & Sour Chicken (or Shrimp or Fish) recipe, here’s the recipe with her introduction and one more gorgeous photo. Although this recipe is titled Paleo Sweet & Sour Chicken, as I mentioned early on and have also indicated by my notes in parentheses, there are alternatives to using chicken. I think that any gluten-free pescetarians reading will appreciate knowing that shrimp or fish can be substituted for the chicken. As a fan of chickpeas and often subbing them for chicken in recipes, I think using chickpeas will probably give you a very nice vegetarian/vegan version of this recipe. That version would not be paleo, of course, but I am sure that it would be delicious! I see myself trying out all these versions because I’ve always savored sweet and sour recipes. However you choose to make Andrea’s recipe, enjoy! 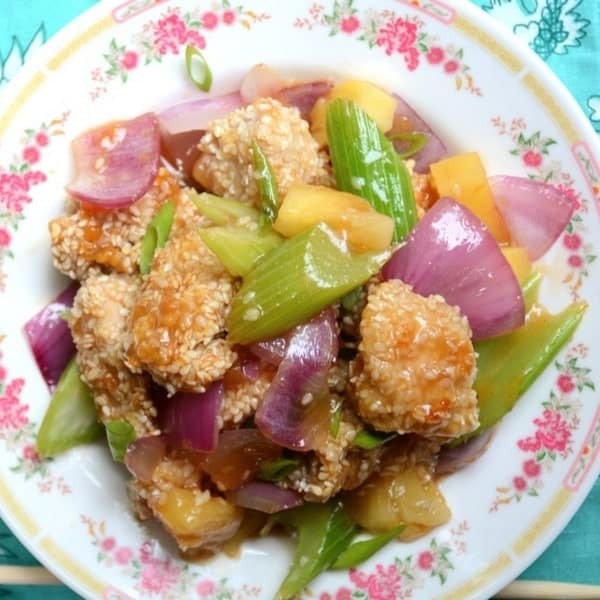 From Andrea: This Paleo Sweet & Sour Chicken (or Shrimp or Fish) can be served on its own (that’s how I enjoy it! ), over a plate of sautéed cauliflower rice, or you can use the sautéed shredded Napa cabbage from my Egg Roll in a Bowl recipe. You can also purchase starch-free “Miracle Rice” to serve with this dish. I tell you how to adjust this meal for 100% Starch Free in the Notes section of the recipe. You can easily omit the sesame seeds as many of my recipe testers still enjoyed this dish without them. Last, the leftovers make a great lunch when reheated the next day. Pure and simple--and divine--Paleo Sweet and Sour Chicken with not very many ingredients, but several options to make this recipe work exactly the way you like. Dredge the chicken in sesame seeds and then set onto a baking sheet lined with parchment paper. Bake chicken for 20 minutes. While chicken is cooking, cut fruit and veggies into chunks. Sauté fruit and veggies in a little oil over medium heat for 5 to 10 minutes. While fruit and veggies are cooking, mix the sweet and sour sauce ingredients together in a small dish, adjust vinegar and sweetness to taste. At the last minute toss in half of the sweet and sour sauce into the veggie and fruit mixture you are cooking. (Set remaining sauce aside.) Stir well, and then transfer the veggies onto a serving plate. Add the remaining sweet and sour sauce to the pan and stir in cooked chicken to get a nice glaze on it. Pour the chicken over the fruit and veggies and serve. Garnish with a pinch of sea salt and sliced green onions. If using fish in place of chicken, the baking time might be closer to 10 to 15 minutes until the fish is thoroughly cooked and flaky. I use apricot jam that is made with only apricots, fruit juice, and pectin. If you are on a zero starch diet and want to omit the apricot jam you can try using 1/3 cup honey and a splash of pineapple juice instead. Or instead of using jam, you take 1/2 cup of dried apricots, chop them up, and soak them in a little pineapple juice for an hour and use a blender to create the sweet and sour sauce with the remaining ingredients.You may need to double the sauce ingredients for a large batch or if you want your dish to be extra saucy. 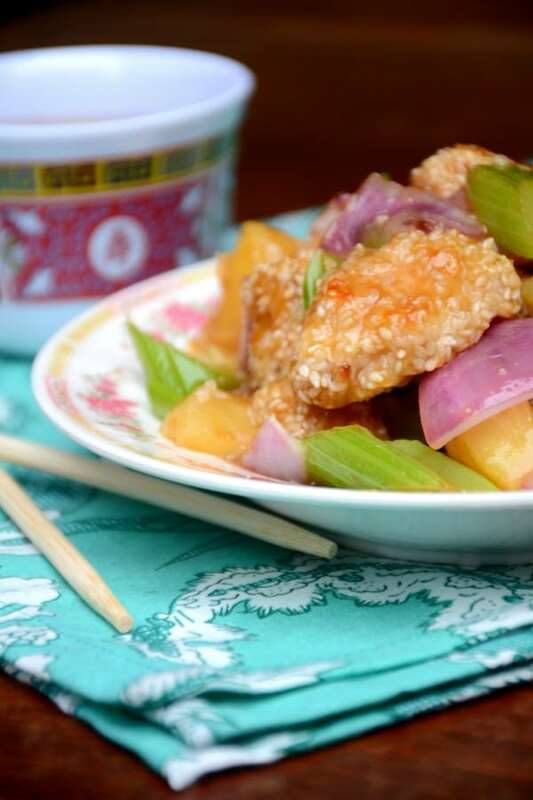 I hope your readers enjoy this sweet & sour recipe as much as I do!! It’s so great to read about natural healthy stories like this! It gives so many hope … and good recipes! This chicken looks delicious. Thank you both for the great recipe. I enjoy Chinese food and also have an autoimmune disease, SLE (systemic lupus erythematosus). I appreciated your story, that shows the importance of listening to your own body and watching the foods you eat. That is great how you seemed able to adjust to going without carbs. I have a hard time with it. Take care on your journey to health. Hi Debbie–It’s good to see you here at gfe again! 🙂 Thanks for sharing a bit of your story and supporting Andrea in her continued journey. I love that with her recipes Andrea shows us all that the low-starch approach does not have to be seen as restrictive, but can be viewed as a new world of foods and flavors–while greatly aiding in recovery. Yum! This looks so good. Bonjour from me in France via gluten free Fridays. Hi Ema–Welcome to gfe! So happy you found me via Gluten-Free Fridays. 🙂 Your potato crust quiche with bacon looks incredible! I’m happy you like Andrea’s recipe and appreciate you stopping by! This looks so good! I can’t wait to read the post about making your own chocolate chips. HEAVEN! That sweet and sour sauce sounds so delicious! I see a veggie stir-fry in my future! Thanks for the update on Andrea, and how exciting that she has a boo!! I need to hop over to her new blog. She was such a faithful contributor to Raw Foods Thursdays. And you’re right, such creative recipes with pure foods! I enjoyed reading this, Shirley! Thanks so my for sharing this with us at Allergy Free Thursdays, Shirley! It’s so lovely that Andrea was able to change her health so profoundly with diet – and her book sounds fantastic! This recipe looks really fresh, healthy and most importantly delicious. I like how versatile it is too! Thank you so much for being a part of The Hearth and Soul Link Party, Shirley!